Feast your eyes on photos from the International Space Station, pictures from China's latest space shot and other cosmic highlights from June 2013. Astronauts have known about the overview effect for decades — and now they're giving the rest of us a taste as well. The overview effect is the spiritual feeling that comes over spacefliers when they see the whole Earth from above. That sight delivers the realization that there are no true borders on the planet, that the whole world is one beautiful, precious blue marble in a black, overwhelming cosmos. Apollo 8 astronaut Bill Anders encapsulated the message when he said, "We came all this way to explore the moon, and the most important thing is that we discovered the Earth." Apollo 14's Edgar Mitchell put it another way: "We went to the moon as technicians; we returned as humanitarians." Today, those views from space are just as precious, and although seeing the pictures are not the same as experiencing the reality, the Internet is making it easier to share all those mind-changing visuals with our borderless planet. The International Space Station provides a true window on the world, and every crew rotation has its featured space photographers. Canadian astronaut Chris Hadfield, who closed out his stint on the station in May, was a standout — as this slideshow attests. But the current crew has some great photographers as well. We've featured a couple of shots in our latest Month in Space slideshow, but there's much more online. Here's where the current crew of space shooters are sharing the overview effect on a daily basis. Italian astronaut Luca Parmitano: The European Space Agency's representative on the station is following in Hadfield's footsteps, sharing his experiences via LucaParmitano.com and flooding his Twitter, Facebook and Google+ galleries with pictures of Earth and scenes of everyday life in space. ESA passes along Parmitano's pictures on Flickr. Parmitano also has a teen protege pulling for him on the planet: Abigail Harrison, a.k.a. Astronaut Abby, a Minnesota student who is getting the word out about Luca's space adventure. On Friday, Harrison highlighted Parmitano's first picture of the United States as seen from space. NASA astronaut Karen Nyberg: The first quilter in space is also a first-rate shooter, sharing her pictures via Twitter, Facebook and Pinterest. Hadfield made music in space with his guitar, and Nyberg may well do the same with the space station's electronic keyboard. "I plan to play some," she tweeted. All this led the Canadian Broadcasting Corp.'s John Bowman to wonder whether Nyberg is the "next Chris Hadfield." 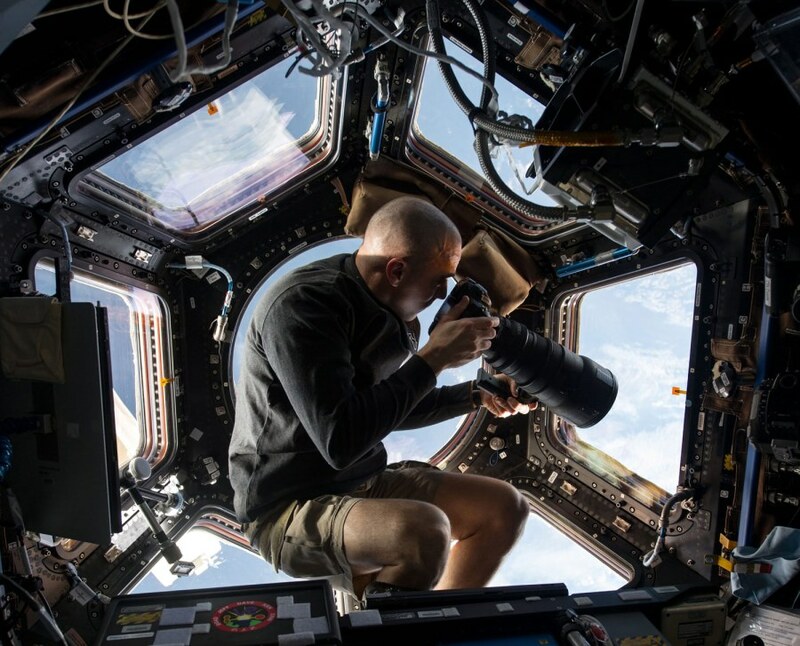 More space station overviews: Nyberg's NASA colleague, Chris Cassidy, has been taking pictures even as he and Parmitano prepare for two spacewalks in July. You can find his pictures, as well as many others from the station, in NASA Spaceflight's Expedition 36 gallery as well as the Gateway to Astronaut Photography of Earth and the NASA2Explore Flickr gallery. Those are also the best places to find imagery from the station's Russian crew members: Alexander Misurkin, Pavel Vinogradov and Fyodor Yurchikhin. Even though Hadfield is back on Earth and retired from Canada's astronaut corps, he's still sharing pictures via Twitter, Facebook and Google+. This one Web page puts you in touch with all of NASA's social media offerings. And if you really want to get the full-frontal overview effect, check out what NASA astronaut Ron Garan and his colleagues are up to on the Fragile Oasis website, Facebook, Pinterest, Flickr, YouTube, Google+ and Twitter.